Drama in foreign language lessons What a performance! Approaches based on drama in education have been increasing in popularity for some years now, including in the MFL curriculum. Why does this strategy work, and what’s the best way of integrating it into lessons? Experiment for yourself using our ideas for drama games. The benefits of this method are clear to supporters of drama in education applied specifically to language teaching: it encourages communication-based, cooperative learning (Birnbaum 2013), students develop their own strategies for dealing with mistakes (Johnstone 2010), it stimulates their imagination, associates the content learned with emotions and increases communicative skills (Haftner & Kuhfuß 2014). There are different tactics for working with theatre methods in the classroom. For instance students can study existing plays in language lessons and possibly put on a performance of an adapted version (Birnbaum 2013). Language teachers could also draw on individual ideas where drama in education is used to deliver specific content, such as practising grammatical structures or language rules in scenes (Kirsch 2013). Another resource teachers could use is theatre improvisation, where students improvise a scene in the moment, completely spontaneously (Haftner & Kuhfuß 2014). There are some features common to all approaches: physical participation and playing with the imagination. This allows fictional situations to become events that seem almost real. Students learn on the move, with their whole bodies and by imagining other sensory impressions. Acting allows us not to have to be ourselves. Students no longer take the mistakes made by a fictional character in a play personally. Also the scene itself is far more important than the little linguistic discrepancies. The drama in education exercises encourage participants to be both spontaneous and creative. Playing a fictional character breaks down barriers in terms of speaking freely, and improves performance. In everyday life we are constantly improvising and reacting to our environment with spontaneous language. In many of these exercises it is possible to simulate this type of situation with a fictional reality. Brief immersion in this other world enables the learner to use precisely the vocabulary and language structures that they have already mastered. If they don’t know a word they will enquire out of interest, or look it up themselves. This provides the ideal conditions for self-motivated learning and the involvement of positive emotions in the learning process. Creating a safe framework is particularly important for students. The teacher will only be able to coax learners to participate in situations that are sometimes still unfamiliar at the start if the group feels comfortable. They are venturing into unsafe territory as students with limited language skills in some cases. Furthermore they are required to experiment with intimate things like emotions and free association. Teachers create a feeling of basic security by putting themselves on the same level as the students. They should not be afraid to act out things that could seem “embarrassing” in a non-theatrical context in front of their group. Then the learners will also be brave enough to do it, and they can begin acting together. They must also understand that mistakes are a very important and unavoidable step in the learning process, and in this context they can feel free to make them. A body and mind warm up in the group is just as important as it would be before a sports competition. For this there are exercises and games to get the group suitably active. A pre-reading plan or collection of a few words for a light-hearted game can also be helpful. Sometimes it can also work well to think of the lesson from the end back to the beginning for planning purposes. If the lesson is supposed to conclude with the “Park Bench” game, in which two people playing fictional characters meet on a stage and hold a short improvised dialogue, then it’s important that the students have developed characters in advance and have already practised a dialogue structure. As a general rule theatre modules should be well planned in advance, but delivered with the necessary flexibility on the part of the teacher. The teacher can inform the class of language rules in advance or afterwards. If certain mistakes crop up repeatedly, the teacher can make notes during the lesson and address them more specifically at the end. Particular new vocabulary arising spontaneously from the workflow can be jotted down where everyone can see it. It’s important never to stop the game for any longer than is necessary. 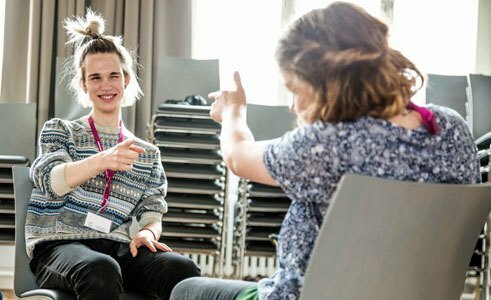 Birnbaum, Theresa (2013): Die Rolle von kooperativem Lernen und Dramapädagogik in Bezug auf das fremdsprachliche Handeln – Aktionsforschung zum DaF-Theaterprojekt Entre bastidores mit den Physikern an der Universidad de Salamanca. In: Scenario Journal Volume 7, issue 1, p. 40-59. Haftner, Magdalena /Kuhfuß, Anne-Marie (2014): Ich habe gar nicht gemerkt, dass ich Deutsch spreche – Wie die theatrale Erfahrung des Improvisationstheaters freies und authentisches Sprechen erlebbar macht und die kommunikative Kompetenz fördert. In: Bernstein, Nils/ Lerchner, Charlotte (Ed. ): Ästhetisches Lernen im DaF-/DaZ-Unterricht. Literatur – Theater – Bildende Kunst – Musik – Film. Göttingen: Universitätsverlag Göttingen, p. 217-233. Johnstone, Keith (2010): Improvisation und Theater. Berlin: Alexander Verlag. Kirsch, Dieter (2013): Szenisches Lernen. Theaterarbeit im DaF-Unterricht. Ismaning: Hueber Verlag. 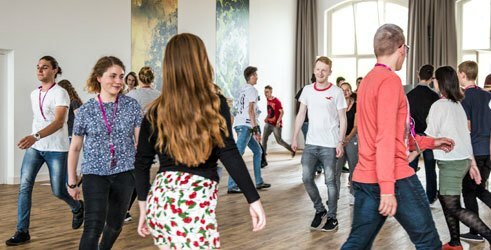 Alexander Riedmüller is a rhythmics graduate, teacher of drama in education and trainer in the fields of “music, movement, theatre, GFL”.